The <pre> tag is representing preformatted text. The text within this element is displayed in monospace font. The <pre> tag is displayed with fixed-width font and it reserves both line break and spaces. <pre> tag is belongs to Palpable content and Flow content. HTML 4 is supports all the attributes of <pre> tag. 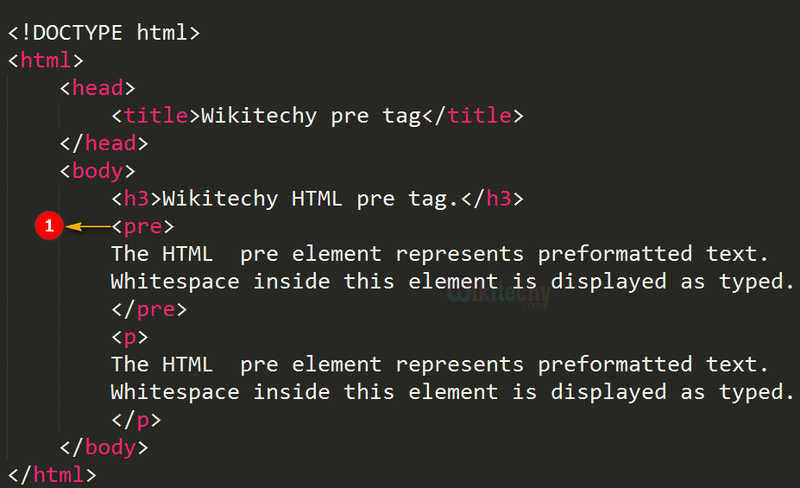 HTML 5 is not supports width attribute of <pre> tag. The HTML  pre element represents preformatted text. Whitespace inside this element is displayed as typed. The text within the <pre> element will be displayed as a preformatted text. <pre> tagged text is displayed the preformatted form with line break and spaces. But the normal text remove unwanted spaces. width number Yes No It is used to set the maximum number of a characters per line. By using the <pre> element the text is displayed with unusual format or some sort of computer code. It displayed line between the paragraphs.